I know people love getting handmade gifts from their kids, grandkids, students, etc., but sometimes I just feel like it's the same old stuff. 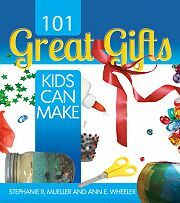 Which is why I love this book, 101 Great Gifts Kids Can Make by Stephanie R Mueller and Ann Wheeler. First off, the Table of Contents gives you all the ideas, broken up into categories. Thank you! So, I'm looking for ideas for Christmas Presents, and I see in Chapter 4 there's a list of "Office Originals." Here you'll find directions on how to make calendars, mouse pads, and other items perfect for Mom or Dad's office, or for a teacher's desk. There is even an entire chapter devoted to "Wrap it Up!" You'll see directions there on how to make gift bags, decorative wrapping paper, and more! The step by step instructions make it easy for your kids to make 101 Great Gifts, just like the title says! Most of these are so easy I think your kiddos could do it on their own. You can purchase 101 Great Gifts Kids Can Make at Gryphon House or other book retailers. I received a copy of this book for purposes of this review.